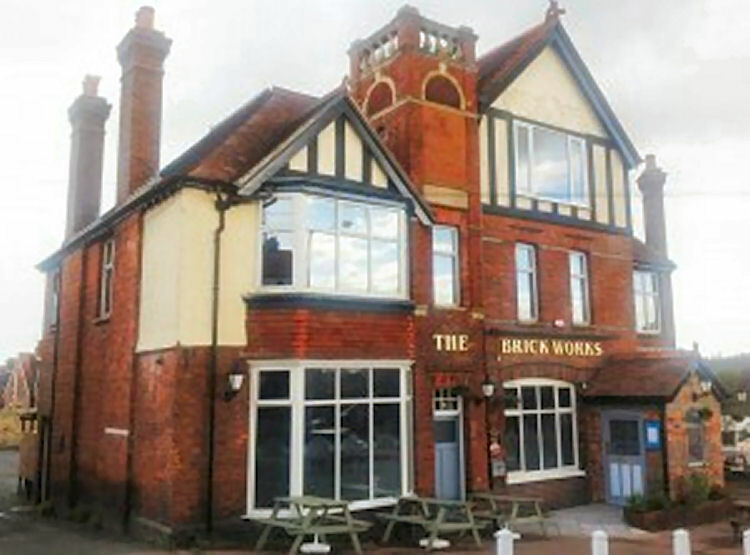 Originally called the "High Brooms Hotel" the premises was built in 1899, closed for a year in 2012 and reopened as the "Brick Works in 2013. Above photo 2013. Showing licensees Peter and Greg Whitaker. Shown opposite is a photograph of the interior of the pub in 2012 with “Barbara pulling pints for punters. This photograph was by Darren Whittaker via the Highbrooms Tavern Face book page. The Kent and Sussex Courier of March 20,2013 ran the following article. “Thirsty inhabitants of High Brooms have been cheered by the news that the community will soon have its own pub again. Residents were distraught when the historic High Brooms Tavern shut its doors in July last year after long-standing landlord Roy Gibb retired. Locals were desperate for the pub to reopen as a traditional watering hole rather than a block of flats-and their wishes have now come true. 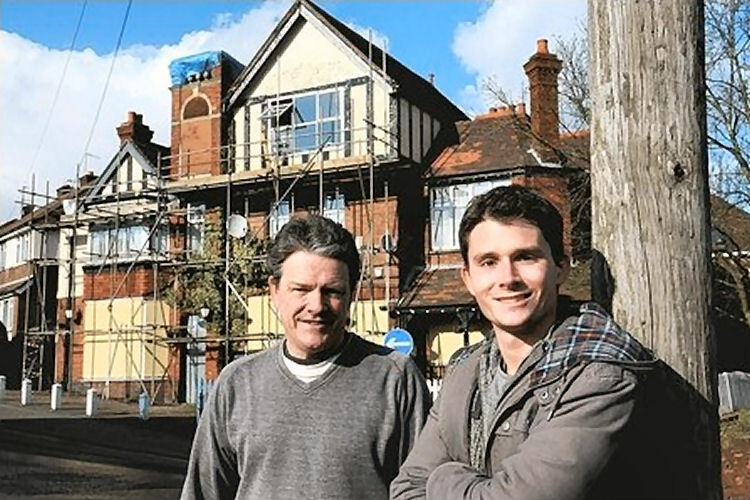 Peter Whitaker, 54, and his son Greg, 23, of nearby Sandhurst Road, have bought the site and renovation is already under way, with an opening date of June of July the target. Peter, who owns properties in Tunbridge Wells and who used to run bar-restaurants in London, said they couldn't resist investing in the old site “it's the original hotel and has a lot of history to it” he said. “We weren't looking to buy a pub, to be honest, but just thought this was an amazing building and there was a real strength of community support. This is a really interesting community pub, and very community-orientated. We thought about it and Greg said “I'd like to give it a shot”. Greg will be the live-in manager of the pub, which will have a new name, and his dad will help out when required. The pub was renowned for having a galaxy of bizarre and historic artefacts hanging from its roof and walls. Many of the more expensive items were auctioned off by Mr Gibb when he left, but some of them have remained, said Peter. “A lot of the stuff's been left behind. We're going to give the pub a good clean up-the nicotine's unbelievable, you could almost cut it with a knife” he said. “But we don't want to fundamentally alter the character. We're going to keep some of the nick-nacks but will bring it into the 21st century. The pair are looking to bring traditional elements such as pool, darts and music back to the pub and contact has already been made with pool leagues and local darts association.' We're looking for it to be a traditional pub and we just want to get the place buzzing again' said Mr Whitaker. High Brooms councillor Dianne Hill was delighted it would be a boozer again…”. A blog posing April 9, 2013 reported on the progress that was being made to the renovation of the pub and said in part “Just finished a knock through from bar area into the saloon lounge today, gives the whole pub a new feel and brings the two rooms together. We are restoring the original bar that was hidden behind the brown tongue and groove boarding on the existing one and getting a new bar top. Looks really grand so far. Jukebox and Harvey's look set to be on the agenda. Haven't got an opening date but hopefully 2.5-3 months. Keep you all regularly posted.”. And so since then the new owners have been busy at work bring the old tavern building back to life. THIRSTY inhabitants of High Brooms have been cheered by news that the community will soon have its own pub again. Residents were distraught when the historic High Brooms Tavern shut its doors in July last year after long-standing landlord Roy Gibb retired. Locals were desperate for the pub to reopen as a traditional watering hole rather than a blocks of flats – and their wishes have now come true. Peter Whitaker, 54, and his son Greg, 23, of nearby Sandhurst Road, have bought the site and renovation is already under way, with an opening date of June or July the target. Peter, who owns properties in Tunbridge Wells and who used to run bar-restaurants in London, said they couldn't resist investing in the old site. "It's the original hotel and has a lot of history to it," he said. "We weren't looking to buy a pub, to be honest, but just thought this was an amazing building and there was a real strength of community support. "This is a really interesting community pub, and very community-orientated. We thought about it and Greg said 'I'd like to give it a shot'." Greg will be the live-in manager of the pub, which will have a new name, and his dad will help out when required. The pub was renowned for having a galaxy of bizarre and historic artefacts hanging from its roof and walls. Many of the more expensive items were auctioned off by Mr Gibb when he left, but some of them have remained, said Peter. "A lot of the stuff's been left behind. We're going to give the pub a good clean up – the nicotine's unbelievable, you could almost cut it with a knife," he said. "But we don't want to fundamentally alter the character. We're going to keep some of the nick-nacks but will bring it into the 21st century. The pair are looking to bring traditional elements such as pool, darts and music back to the pub and contact has already been made with pool leagues and a local darts association. "We're looking for it to be a traditional pub and we just want to get the place buzzing again," said Mr Whitaker. High Brooms borough councillor Dianne Hill was delighted it would be a boozer again. "It's fantastic news and it's great that locals have bought it," she said. "We desperately need a pub in High Brooms – so we just need to get people using it now. "I'm surprised it's going to be a pub again but very pleased, it will be excellent for the community. "We really do need that pub and it's really been missed in the past few months."